Otherwise known as the little Santa Claus looking creatures that I used to think were ridiculous and now are multiplying in my yard! The obsession started off small with just a couple of gnomes. Then the gnome home became a village, with decorations such as mushrooms. I could not resist this sleeping gnome. Then the big daddy of them all! Gabe was completely against purchasing this gnome as he told me he looked like Santa and people would think we were decorating for Christmas in June. I just about had him convinced that it was indeed a gnome and not Mr. Claus, when I sat him at the counter to purchase him and the cashier blurts out, "Oh Santa! How cute!" Thanks a lot lady! Haha! 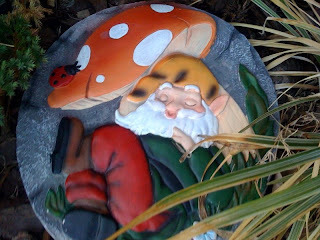 Gnomes don't really do it for me, but then again I don't have a backyard to decorate with random stuff. I am looking though...I know I will find him. Is "Real" TV Too Real? Why Does it Always Happen in Three's?